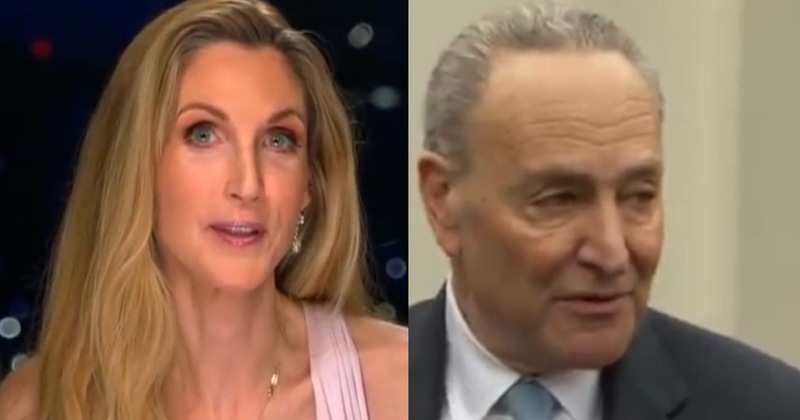 Ann Coulter, speaking to a SiriusXM Patriot’s Breitbart News Tonight, made too much sense when she offered Chuck and Nancy some common sense reasons to drop their obstruction and fund of the wall. History is watching, do the right thing, Chuck. “I would also go to all of the working class that are in America, construction workers in particular. Their salaries have not just stagnated, they have gone down in the last 20 years. These are the least among us. We are the only ones not speaking out of self-interest,” Ann said. “Most of the people who are advocating for open borders … they have a vested in interest in having either the cheap labor or the Democratic voters. Their neighborhoods aren’t the ones being overwhelmed. They get the cheap maids, the cheap nannies, and then they strut around like they’re Martin Luther King,” Ann reminded the hypocrites on the left. “The heroin problem in this country is 100 percent a problem of not having a wall on the border. And 70,000 Americans are dying every year. That’s more that died in the entire Vietnam War. That is a national emergency,” Ann said. Correct – do your jobs for the right reason and get the government back to work. Mitch McConnell finally entered the fight (where ya been Mitch?) and shamed Chuck Schumer for throwing a temper tantrum. “Now they’re threatening to shut the Senate down, too. … They’re threatening to shut down efforts to protect our allies and strengthen our relationship with Israel, something they all recently claim to support,” McConnell said from the Senate floor. Democrats, including Minority Leader Charles Schumer (D-N.Y.), are expected to vote against taking up a foreign policy bill, arguing the Senate should keep its focus on government funding legislation. “They’ve put that partisan tantrum ahead of keeping a quarter of the government open and now they’re saying their partisan tantrum is more urgent than pressing legislation that concerns our alliances with Israel and the Syrian civil war,” McConnell said. The foreign policy bill includes sanctions against the Syrian government while bolstering U.S. support for Jordan and Israel. It’s scheduled to get a procedural vote on Tuesday evening. Democrats will need 41 votes to block the bill. The Democratic decision to try to block the bill comes as funding for a U.S.-Mexico border wall has stalemated government funding negotiations aimed at resolving the partial shutdown.